It’s trending in our social networks. We hear it on our podcasts. We see it during chapel at our Christian colleges. Racial reconciliation. Two words heavy enough to hang the head of any white male seminary student. Being myself of the targeted demographic, the two words used to create confusion for me. “Don’t I want to see reconciliation between the races?” More questions would follow—“But is there even such a thing as ‘race?’ Isn’t that an evolutionary idea? Ok, fine. Don’t I want to at least see ‘ethnic’ reconciliation? But what responsibility do I have for the wrongs of the past? Am I somehow at odds with people of other ethnic backgrounds because of the background I was born into? What about ethnic groups that have wronged my ancestors? The seminary I was attending and denomination I was part of at the time put a lot of emphasis on what the administration termed to be “racial reconciliation.” The initiative was expressed in various ways, from over representing minority speakers during chapel (whether they could speak or not), to the formation of an affirmative action initiative in the admissions department. Martin Luther King Jr. Day was celebrated with a lecture series on African-American experience, while prominent historical figures who were actually significant to the denomination itself were passed over without even honorable mentions at any point during the academic year. The Black Lives Matter movement even made, and I’m sure is still making, inroads into the seminary. Panel discussions on police shootings (whether they were justified or not—that point was irrelevant) and the importance of taking down the Confederate flag were deemed as worthy of chapel time, even while other issues of greater significance to the ministries of the graduating student body were barely covered. I remember my room mate telling me that he would barely pay attention sometimes in chapel during escapades into the social justice of racial reconciliation. He wanted to know the Bible and how it applied to his ministry. Most of these discussions didn’t qualify for the reason he was paying to study at seminary in the first place. I can only surmise that there were more who felt the same way, but who didn’t know what to do except ignore it? Was it really worth our time to complain about something that would only incorrectly portray us as “racists” to the administration if we did? It was difficult to even articulate why we were either disinterested or disagreeable to the efforts to win us to racial reconciliation through the endless barrage of “white guilt” for the hate crimes our cultural and theological ancestors apparently carried out. Now that it’s been a few years, and as recent events in the denomination have transpired, it’s become apparent to me that the emphasis upon “social justice” and “racial reconciliation” have only become more prevalent. I believe now more than ever, it is imperative upon me to stop ignoring, and start speaking out. This is a gospel issue. 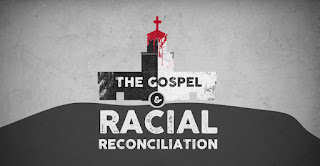 I strongly believe that this new obsession in certain circles with “racial reconciliation,” is in direct contradiction to biblical reconciliation. The two cannot coexist. One will dominate the other. And for a denomination that has escaped the entangling clutches of rationalistic liberalism, to only have been shipwrecked by the postmodern concepts of “racial reconciliation” and “social justice,” is a travesty worthy of someone sounding the alarm about! It is my belief that most of those who are now buying into this false gospel still believe in a true gospel and just have not quite seen where the two contradict. Hopefully this analysis lays out the problems so people can wake up and free themselves from this modern-day heresy. The biblical gospel focuses on eradicating internal heart sins. The gospel of racial reconciliation focuses on eradicating external behavior sins. In Matt 15:11, 19 Jesus said, “It is not what enters into the mouth that defiles the man, but what proceeds out of the mouth, this defiles the man. . . For out of the heart come evil thoughts, murders, adulteries, fornications, thefts, false witness, slanders.” In other words, the source of evil is inside of every individual, waiting to be expressed in external actions. The gospel changes a man internally so that he or she will possess new affections and desire different things. God orders our desires in such a way that external actions change as a result. (2 Cor 5:17, Gal 2:20, 2 Tim 2:21). Not so according to the GRR (Gospel of Racial Reconciliation). Evil is something quite external. Now I’m sure at this point some would object. They may say, “But it is the evil within man’s heart that causes the outward action of discrimination. We recognize this!” I have no doubt that some do recognize this. The problem is practically speaking, this is not what’s usually communicated. The academic and media push toward “white guilt” and “reparations” completely externalizes evil behavior onto civic institutions (i.e. the police), political groups (i.e. the “Alt-right”), cultures (i.e. the “South”), ethnic groups (i.e. “white” people), socio-economic conditions (i.e. poverty vs. wealth), and even inanimate objects (i.e. various flags or cultural icons). The Christian version of this—racial reconciliation—simply parrots the media’s presuppositions. Dealing with the sin of pride, the root of all true racism, on an individual level is rarely ever discussed. Finding our identity primarily in Christ instead of in ethnicity is not highlighted. What is talked about is removing flags, understanding the “black experience,” and creating more opportunities for minorities. These can potentially be good things in theory (I don’t believe they are in the modern way they are being applied), but they do nothing to bring about racial reconciliation if the heart of the matter is left out. To give an example. If I go on with my life the same way I always have, spending time with diverse friends regardless of their ethnicity, supporting a Haitian child financially, and giving my time to various ministries including inner city evangelism, I have not racially reconciled because I have a little Confederate flag on the back of my pick up in honor of my non-slave holding ancestors who fought nobly to defend themselves. Let’s say I take it off. Now I still have not racially reconciled perhaps because I have not done enough to truly “understand” the plight of cultural minorities. The main thing I’m getting at here is, the fact that I’m white will always leave me lacking in this department. I am part of an external group—“white people”—that inhibits my efforts to reconcile, regardless of the status of my heart. Thank God that the true gospel tells me that once my heart is cleansed I am clean. John 15:3, “You are already clean because of the word which I have spoken to you.” The GRR leaves me dead in my sin of racism. The biblical gospel sees men as individuals needing personal salvation. The gospel of racial reconciliation sees men as associations that need to undergo group conversions. The Biblical gospel focuses on sins committed by those capable of repentance. 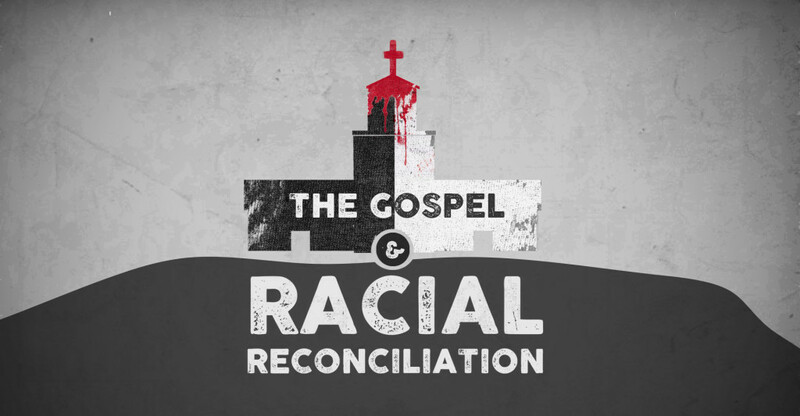 The gospel of racial reconciliation focuses on sins committed by previous generations. Almost every time an act or supposed act of racism occurs against a minority or group of minorities the media loves to drum on about our country’s racist past as being one of the primary reasons such a crime occurred. Unfortunately, the GRR accepts the same premise. Oftentimes it is the past sins of slavery or opposition to civil rights that are targeted as problems that must be atoned for in this day and age. Granted, there is a certain logic to this. Stolen property doesn’t become “un-stolen” just because one generation has died off. I suppose if I wanted to I could claim that General Sherman and the United State’s government owes my family a great deal of compensation for destroying farms, burning churches, and stealing property. Native Americans have gained many advantages by utilizing this logic. For the record, I don’t believe it is in my best interest or the best interest of this country to look for this kind of compensation, but that’s for a separate discussion. Where this concept pertains to this discussion is in this way—Do past wrongs incur a fundamental guilt upon those whose ancestors committed them? In other words, are General Sherman’s descendants responsible for his sin against my ancestors? The Bible gives us a very simple answer. No. Ezekial 18:20 states plainly, “The person who sins will die. The son will not bear the punishment for the father’s iniquity, nor will the father bear the punishment for the son’s iniquity; the righteousness of the righteous will be upon himself, and the wickedness of the wicked will be upon himself.” Legal compensation and federal headship as theological issues are good discussions to have, but the fact remains that each man is personally responsible for only his or her sin, and not the sins of anyone else. The gospel of Jesus Christ washes me clean of my sin, not my father’s. The GRR says I must be washed clean of my father’s sin as well. This is why it is a heresy. The biblical gospel is by grace through faith and not of works. The gospel of racial reconciliation is only through works. Eph 2:8 states, “For by grace you have been saved through faith; and that not of yourselves, it is the gift of God. not as a result of works, so that no one may boast.” A repentant sinner comes to Christ with empty pockets knowing that he or she has no good works that they are capable of giving Christ. As they cast themselves upon the mercies of Christ an alien righteousness not their own is afforded them (2 Cor 5:21). In GRR this is not the case. In order to receive grace, the penitent must take down their allegedly offensive symbols, throw their political support behind certain causes of the left, and apologize in some way. A certain prominent denomination has started making a habit of all three, especially the last requirement. The resolutions and subsequent declarations at most denominational meetings seem endless. The interesting thing is that they’re never enough for some. Christians must keep doing “more.” It is an endless process of works righteousness to obtain racial reconciliation. Some may object and counter, “But doesn’t the gospel change the life of the sinner? Should the sinner give up symbols of his sin and start giving to the church, etc. etc.” The answer to this question is, “Yes, of course.” The difference however is this. In the case of the biblical gospel, the sinner is saved BEFORE he or she has given up all their symbols of evil and started giving to their church. In GRR the blessing of being enlightened and ethnically aware only come AFTER making such changes. Of course these changes must constantly be redone to prove continually that one has truly repented of their inner racism. Thank God that His requirement for the sinner is faith and not works that would be impossible for any of us to do. The biblical gospel presents reconciliation as one moment that covers the rest of life. The gospel of racial reconciliation advocates an everlasting process. Heb 10:11 could have been written about GRR. “Every priest stands daily ministering and offering time after time the same sacrifices, which can never take away sins.” The author of Hebrews was of course referring here to the Jewish ritualism that denied the sacrifice of the Messiah as being sufficient. In verse 14 a contrast is made with the biblical gospel, “For by one offering [Jesus] has perfected for all time those who are sanctified.” The constant barrage of denouncing political groups, vilifying symbols, admitting guilt over and over looks more and more like a creepy pagan ritual than it does a Christian organization trying to live out the true gospel. Reconciliation between God and man takes place when God receives the sacrifice of Christ as payment for the sins of repentant man. In GRR all we have is constant payment without any reconciliation. I would challenge any seminary student to ask their president, dean, professor, etc. who advocates for GRR when the process actually end. When is reconciliation between the races achieved? There is no stated goal. There is time frame in which reconciliation is hoped to be achieved. Furthermore, in a biblical reconciliation, both parties are required to make the relationship right. Who is the valid spokesperson for the ethnic minorities who will finally proclaim us white folks free from the curse of racism. There is no such person. All there is is endless sacrifice. Well tell ourselves that we did a good thing. We made a big “step” in amending race relations, but the stairs never seem to reach the second story. All we are left with is guilt that we could not have done more. We failed. Again. And we always will so long as we pursue racial instead of biblical reconciliation. Hopefully you can see the issues inherit within the heresy of GRR. We play right into the hands of a godless culture that would love to point out the hypocrisies of Christians and hold us accountable for them until the end of time. My suggestion to Christian denominations and organizations is to confess and move on. The IFCA International had denied the entry of a black seminary and several black churches in the 1930s. You know what they did today? They let them in. They said that the organization was wrong to do what it did in the 30s, and now they are going to do the right thing. That was it. No endless campaign about how evil they were for their racism (a sentiment none of the new members were even around for), just a simple, “We were wrong, come on in!” This is my prayer for other modern denominations and seminaries. Focusing on sin, especially sin that isn’t yours, only hurts those who focus on it. Instead focus on Christ. Focus on a God who breaks down the barriers of Jew and Greek, slave and free. Focus on having an identity in Christ that comes primary to an identity in any ethnic group. Focus on showing love today. Here and now. Stop rolling around in the regret of things you wish your grandparents would have done. They’re gone now. Do better than them in this area, and try to honor them for the areas in which they shined. Every generation has their sins and blind spots. And most of all, preach and live in the true, personal, once-for-all, gospel of grace. Jonathan, good analysis and impassioned plea to return to Gospel, the core message of Christianity and the only solution to racial strife. I've read your article 3 times now and have struggled with it each time. I understand the premise, but I think you are missing the mark. First, I want to say I am not a white male. So I cannot fully empathize with how you feel every time you hear the term racial reconciliation. I do recognize that in many ways it does seem that white males have found themselves the poster child for all things going wrong with race relations. I also recognize that constantly listening to pundits and reading articles which seem to always affiliate whiteness with being wrong, even though one may be living a true multicultural existence, would be infuriating (welcome to the existence of a black male). Additionally, I am in total agreement with your thesis that we are dealing with a heart problem, and all believers recognize that only Christ can change hearts. So in this sense I do agree with you in regards to GRR. However, let me take it a different way. In its purest sense, the Gospel is the key. However, how each of us interpret the Gospel in our denominations can put up additional road blocks to the application of the Gospel. If, as an institution, the church has perpetuated racial injustice, hindered fellow believers from joining, and used its authority to solidify power for some at the dignity of others, then we (meaning the church) are the reason why people focus on external measures (better policing, housing equality, reformed judicial system) for results. If we do not fix our house, we can never expect true reconciliation. To be honest, I don't think the church really wants that. I think we focus so much on sticking to the gospel and ignoring social issues (unless its abortion and homosexuality) because we don't want to face our own sin and do the hard work of repentance and restoration. Now, Racial Reconciliation calls for everyone to admit there is a problem. Simply saying we live multicultural lives and volunteer in an inner city does not mean the problem has gone away--as you have correctly attested. What I have found with many of my white friends when we talk about race is that they want to separate themselves; "well, I do this, or I don't do that". That is great, but you can't end there. If you recognize treatment is not biblical, you should be against it, speak against it, vote against it. At its core, this is what RR is asking for. It is asking for outward examples of heart change. Ok, well I wrote a whole response and I'm not sure what happened to it. I don't have much time so let me see if I can write you something short and concise. First off, thank you! I appreciate so much your humble tone. I am used to being dismissed by many on the other side of this issue so once again thank you. Secondly, if you are one in Christ with me then our bond is greater than any ethnic category can contain. I think the heart of the issue comes in the third paragraph of your comment where you state, "If, as an institution, the church has perpetuated racial injustice, hindered fellow believers from joining, and used its authority to solidify power for some at the dignity of others, then we (meaning the church) are the reason why people focus on external measures (better policing, housing equality, reformed judicial system) for results. If we do not fix our house, we can never expect true reconciliation." Your comment is very well-thought through and it's a joy for me to interact with it. I think what would help people on my side of this is if specifics were given. So the church as an institution perpetuated racial injustice? I don't care for the broad stroke, but I agree that at times denominations barred those of different skin colors from entering. I addressed this in the original post you're commenting on and recommended what the IFCA did- repent and move on. As for "solidifying power." I think I would take some issue, depending on what you mean. Do black Reformed rappers solidify their ethnic power over their white audiences? No. If anything, in the circles I run in ethnic minorities are overrepresented on the stage at conferences and chapels if we take into account the numbers of ethnic minorities in the audiences generally. This doesn't bother me. I don't know what it should. Again, specifics are helpful. If you can provide me with denominational statements, or statements from leaders that are representative of the church as a whole that would be helpful. They have to be statements that say, "We don't want black people here," or something along those lines. If the response is, "Well they aren't going to say those things, but they act that way," we are in a conspiracy theory and we are judging heart motives without any evidence. I think when you brought up housing policy, etc. this really gets to the heart. Those who are critical of GRR have said it's neo-Marxism. I would agree. The issues you brought up are issues that conservatives would see very differently. I think a biblical view of government would provide solutions that are entirely out of sync with the proposed solutions of the Left. I've written about it some on this blog, but to give a very quick example- the welfare state has lead to many of the inequities. The welfare state is anti-biblical, evil, and bad for those who depend on it. That's the opinion of a conservative, and I would argue if time permitted a consistent biblical view of the role of government. This is perhaps where the great divide is- on the role of government. Government is a ministry of justice, the church is a ministry of grace. If the government fails in its job to be impartial with regard to the application of God's moral law (justice), the church can be a prophetic voice as John the Baptist was to Herod. But, John the Baptist could name a specific sin- "Herod you're stealing your brother's wife." Proponents of GRR don't seem to be naming specific sins. "Hey 'white' people you live in the suburbs?" It is not a sin to belong to an organization more white people happened to have joined than black people. It is not a sin to live in the suburbs. It is not a sin believe the welfare state should be systematically dismantled. It is not a sin to support respecting the American Flag, or oppose the destruction of Confederate and colonial monuments. It is not a sin to be born into a middle class family. Etc. Etc. but these are the things called out and treated as sin. If the government is sinning against black people those opposed to the GRR would most certainly stand up against the tyranny I am certain. I know I would. But we have a disagreement over the role of government, this is not the same thing. And those pushing GRR are generally targeting the church and saying, "Why don't you get on the progressive bandwagon?" To that we say, "No thank you, that's what got us here in the first place and caused many of the inner city problems." I hope that helps some. I appreciate your thoughts and would be curious if you know of specific instances of racist statements from denominations or evangelical organizations because I would be the first to stand against them if you do. I don't know everything, so perhaps I missed something somewhere.